I hope you have had a great summer. My family and I spent a great holiday camping in Devon (South West England). Really good fun and plenty to do in that renowned tourist area. In particular my daughter had a ball and made a lot of new pals to explore the campsite and local woods with. Kids are great at finding some mates to knock around with. We also made friends with the parents of course, as all the families spent time round the communal camp fires in the evening. On hearing about our website we had lots of discussions about fundraising particularly for schools and plenty of new suggestions and ideas. Most of the parents were very enthusiastic about their schools' fundraising and, rather than see it as too much of a chore, view it as part and parcel of school life. It seems that more adult events for parents are particularly popular at the moment. A glass of wine helping overcome newcomers' inhibitions and shyness! As the schools start back for the new term we will see plenty of parents getting engaged with their local parent teacher organisations for the first time. As with all fundraising organisations being welcoming and non-cliquey is the best strategy for getting them on board. Also simple things like a PTA table staffed by a couple of volunteers at kid collection time is a simple way to break down barriers and get talking to new mums and dads. This time of year is also the traditional start of many teams' sporting seasons. We have lots of ideas for sports fundraising but always love to hear about any fundraising events or successful fundraisers you run for your team, so do send them in to us. 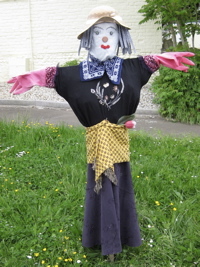 This certainly seems to have become a real feature and annual fixture for many villages in the UK and scarecrow festivals seem to be popping up all over the place. Is the same true for other parts of the world? Let us know. It seems it a great way of including a whole village for a fundraising event; enthusiasm, I am sure, being stoked by friendly rivalry as families compete to have the best scarecrow in their front garden! There seemed to be plenty of scarecrows with a royal theme this year......something to do with a certain wedding perhaps? The success of scarecrow festivals does show one thing however. Fundraising events work really well when there is a clear idea at the heart of it. Come up with a good concept and creative ideas for how you can fundraise from it will flow. How will you make your annual event a bit different next year? Saints Alive - Are you missing something right under your nose? Is your church or school named after a saint? A great many are. Why not use "your saint" as a handy excuse for some inspired fundraising. All saints have a special day allocated to them and what an excuse for a fundraising party or event. It could be the perfect theme for a whole afternoon or evening of fundraising fun. If you wanted something a little simpler how about the St. So-And-So annual raffle, or selling St. Whats-Is-Name cookies to parents as they collect their kids from school (or your church's congregation as they leave Sunday Service). You don't have to be too literal but saints can provide a good hook and an opportunity for local tradespeople to promote and market their businesses whilst raising funds for you. A happy day on the beach with my daughter Loveday turned up a great fundraiser we are looking forward to trying out at the next school fair. We collected these limpet shells. They are perfect for hiding a "treasure" such as a coin £1 / £2 (or other currency). 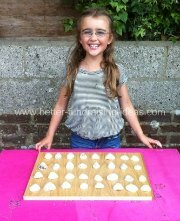 A "prize every time" sweet under all the others and we reckon people will love to pay for 3 tries to find the lucky shell. Pre-heat the oven to 190 C and lightly grease a shallow 28cm x 18cm baking tin. Place all the ingredients in a large bowl and stir well to combine. Turn the mixture out into you tin and press down into all the corners with the back of a spoon. Bake in the pre-heated oven for 15 - 20 minutes or until golden brown. Take Care and we hope you continue to have a great Autumn of fundraising success.